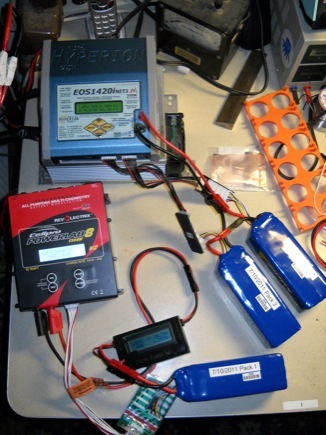 I finally took the plunge on some hobby airplane-style Lithium battery parts for the ebike- it’s needed it for so long! I gaffa-taped them to the bike and took a late night test ride. What an amazing upgrade! Losing 45 Lbs and gaining 10+ volts makes an amazing difference. 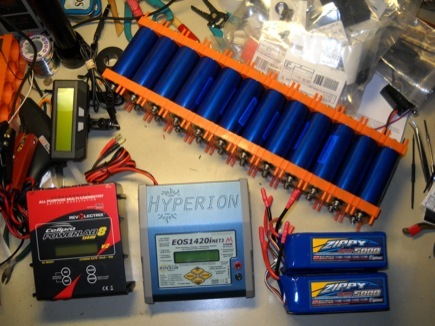 Even these cheap LiPos are incredibly stiff (compared to lead, at least) and deliver amazing power. I like the Hyperion charger alright and I love the Powerlab- if only it could do 12s- the design is otherwise top-notch in every way- at least from my tiny amount of experience so far. The regenerative discharge is also a super neat feature. I observed a no-pedaling top speed of 30.5 mph, while pulling about 1500W. Much greater efficiency can be had from slower speeds. I need to figure out how to set up cruise control for easier economy-riding. 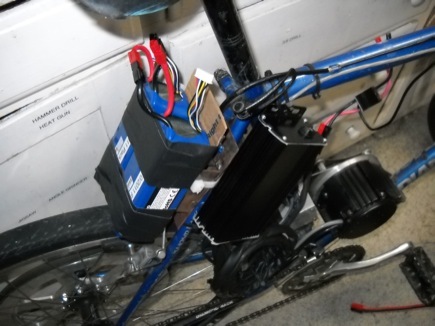 I think once I get these batteries attached to the bike in a more legit fashion I will definitely be good to try taking it on BART for the work commute. Can’t wait!